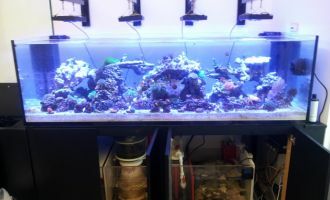 in saltwater aquariums from fish only to full blown reef systems. for commercial and residential aquarium displays. project is handled with the utmost expertise and care. designs Reef Trends is your solution to aquarium bliss. 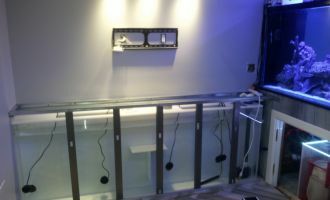 We can design and install anything from a small decorative tank, to a large centerpiece aquarium in your home or office, to a complete commercial or retail system. Fully insured and available to install all standard aquariums as well as design and install custom aquariums to suit any need or setting. Installation of is done professionally and is personally tailored for each system. Our skilled staff can provide maintenance services to keep your tank sparkling and vibrant. There are plenty of aquarium stores that also provide aquarium maintenance services as side-line operations. Unfortunately many of these businesses have limited resources to devote to this type of specialized care. Retail stores are focused on just that, the retail environment, and are often not staffed by the most knowledgeable reef (and particularly installation/maintenance) personnel. 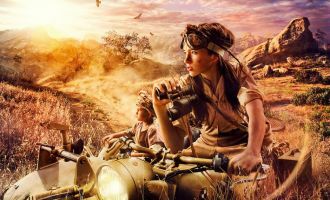 Given that retail is much more profitable then aquarium maintenance it’s often hard for them to justify sending their most experienced staff into the field when they can generate more income in house. The result is that many aquarium stores use some of their less-knowledgeable employees to provide outside maintenance and rush through the job. As we don’t operate a retail store, our expert technicians are dedicated to our core mission and always available to provide excellent aquarium services. We supply all the necessary maintenance equipment, cleaning tools and water change equipment. Some companies make you purchase the tools needed to do their job – we bring our own and save you time and money. We are fully insured. It is surprising how many aquarium maintenance companies and retail stores provide aquarium installation and maintenance services without proper insurance. Regular retail business liability policies usually do not cover accidents that occur off store premises. Reef Trends carries full liability insurance of 2 million dollars. Reef Trends offers combined discounts and price flexibility ensuring competitive pricing. Contact us today for a free consultation and estimate and see how the Reef Trends advantage can get to work for you.
" He showed up on time; had all necessary tools and parts to do the job; did the job; and afterwards stuck around to make absolutely sure there were no leaks and to fine tune. Now my 4+ year old tank is purring along like new. The price was right too. " " Great vendor and special pricing is great! " 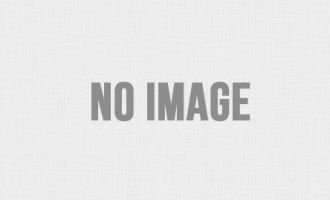 " I can testify that his products are well designed at a great price. " "Great business to deal with! Fast, reliable, and honest!" "The nicest most honest person in the biz.Super professional and on time.Great prices and super knowledgeable. Total class act." "Reef Trends is legit! Really nice guy, definitely knows the hobby. If you need anyone to do maintenance on your tank or need equipment or just advice, he is the person." Let the professionals at Reef Trends handle your design, installation, relocation or maintenance affording you peace of mind that it is done correctly and with the upmost care. We have the expertise and resources to do the job right and guarantee our work. At Reef Trends our mission is to work hard to make sure you and your aquarium inhabitants are happy. We custom tailor our aquarium services to fit your lifestyle and schedule. So call or contact today for more information or to schedule a visit. Reef Trends experts are available to consult with you on your existing or next project. We can design anything from small decorative aquariums to large centerpiece aquariums for your home or office. Working closely with architects, builders and artists we can help make your dream a reality. Whether permanent or temporary our experienced staff will manage and oversee the entire setup process. We are fully insured and available to install all standard or custom aquariums to suit any need or setting. Installation of equipment is done professionally and is custom suited for every job. 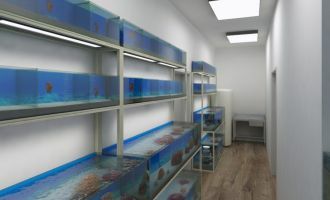 If you need to move your aquarium, whether from one room to another or to a new home, Reef Trends can take the hassle out of your relocation. We have all the proper equipment and knowledgeable staff to get the job done right. We will dismantle your aquarium, carefully pack everything and move your aquarium to its new location then reassemble everything. Once your aquarium setup is complete our skilled staff can provide complete maintenance to keep your tank running. Contact us to see how Reef Trends can get to work for you. We offer a full line of aquarium supplies from over 100 brands at competitive prices. Sign up to our NewsletterEnter your email address below to receive our monthly fun-filled newsletter. We guarantee your complete satisfaction with our services for 48 hours after we service your aquarium(s) provided that you have your aquarium maintained by us at least once a month. If you are not happy with the way the aquarium looks, experience any equipment malfunctions or have any livestock deaths within 48 hours after service we will address the problem or replace the livestock free of charge. We must be notified of issues within 48 hours and we will return to rectify the problems asap. Reef Trends ©2018 All rights reserved.